Lively jazz, extravagant costumes, 19th-century steamboats, spicy Creole food, and cold cocktails are a few key ingredients that go into the unique mix of New Orleans, Louisiana. This eclectic southern city goes by many names – NOLA, Crescent City, the Big Easy – and its culture has many faces, including French, Creole, Caribbean, African-American, Irish, German, and Vietnamese. No wonder the specialty food of this melting pot is gumbo stew, and the music it invented is an improvisational jumble of mixed musical heritage. Read on for the 11 top things to do in New Orleans, the vibrant, multicultural city on the banks of the Mississippi. There’s a lot to see and do in New Orleans, so this list of New Orleans attractions gets pretty long. Use this table of contents to go directly to a point of interest, or simply scroll down to read my full list of the best things to do in New Orleans! Let’s start this New Orleans travel guide with an exploration of the city’s historic neighborhoods. Get ready to step back in time to NOLA’s beginnings as a colony of France. New Orleans is one of the oldest cities in the United States, making it also one of the prettiest and most atmospheric. It was first settled by the French in 1718, later came under Spanish rule, and was finally bought by the U.S. as part of Thomas Jefferson’s Louisiana Purchase in 1803. You can still see French and Spanish influences in the architecture today. New Orleans’ French Quarter, in particular, retains its historic charm and dates back to the city’s colonial beginnings. We’ll start in the French Quarter, and then look at some of the other districts that you should visit on your trip to New Orleans. The French Quarter is the oldest and most visited section of New Orleans. Its colorful buildings boast French and Spanish-style balconies, pretty long windows, and tumbling flowers. The French Quarter is about six blocks wide and 13 blocks long. It’s filled with shops, restaurants, cafes, bars, music venues, clubs, and antique stores, so there’s plenty to do, see, buy, and eat. As the French Quarter is a heavily visited area, it has a lot of places to visit. Below are some of the French Quarter’s most important streets and historic sights. The French Quarter is a great place to start your visit in New Orleans and get a sense of its colonial beginnings. You can walk the oak-shaded streets, admire the colorful architecture, look at historical statues and churches, shop, eat at exciting new restaurants, and see live jazz at night. Here are some of the top places to walk during the day and go out at night. Bourbon Street: If you couldn’t tell from the name, Bourbon Street is bar central. It’s relatively quiet during the day, but turns into a raucous party at night. Bourbon Street is one of the more touristy areas, but there are a few nice restaurants and authentic music venues mixed in. This street can get pretty sleazy at night, but it can also be a lot of fun, depending on what kind of experience you’re looking for. Royal Street: This street is more upscale than Bourbon Street, with specialty shops, art galleries, and restaurants. It’s a pretty place to walk and window shop, even if you’re not planning to buy anything. Jackson Square: This old town square gets filled with performers, live music, food vendors, portrait artists, and tarot card readers. You can see St. Louis Cathedral here, the oldest Roman Catholic church in the U.S.
Lower Decatur Street: This street has a lot of restaurants, bars, and music. It’s a more authentic spot for live music than Bourbon Street. Chartres Street: Here you can find the best preserved colonial architecture in the French Quarter, along with a bunch of shops, cafes, and restaurants. Old French Market: This 250-year-old market sells foods, crafts, and souvenirs. St. Louis Cemetery: Come here to see a spooky Southern Gothic cemetery with marble tombs and moss-covered statues. Visit the burial site of legendary “voodoo queen” Marie Laveau, and you might see pilgrims making offerings at her grave. St. Louis Cemetery is a popular stop on New Orleans ghost tours. The Uptown area of New Orleans is largely residential, but visitors enjoy it for its beautiful 19th century architecture. It’s also a good spot to walk around for a break from the tourist crowds that can fill the French Quarter. The most visited street is Magazine Street, six miles of antique stores, clothing stores, specialty shops, art galleries, restaurants, and cafes. You can also come here for the expansive Audubon Park and Audubon Zoo and see the campuses of Tulane University and Loyola University. A unique way to get around Uptown is to take the St. Charles Avenue streetcar, one of the oldest trollies in New Orleans that runs through this neighborhood. If you head down the Mississippi from the French Quarter, you’ll get to this bohemian, relaxed area of New Orleans. Its main attraction is Frenchmen Street, which is probably the best place to come for nightlife and live music. On any given night, you’ll find live jazz, rockabilly, Latin American, and other types of music. The Downriver district also contains the 7th, 8th, and 9th wards of New Orleans, the areas most affected by Hurricane Katrina in 2005. Many of these areas are still working on rebuilding after the devastation. Come to the Central City district on your New Orleans vacation if you want to see a game at the Superdome or visit art museums. This area contains the business district of New Orleans, with its skyscrapers and high-rises. On one edge sprawls the Superdome, one of the world’s largest sports venues. The Superdome hosted the 2013 Superbowl. It also provided shelter for people who hadn’t evacuated the city during Katrina. The other main attraction of Central City is its revitalized Warehouse District. It contains the experimental Contemporary Arts Center, as well as the Ogden Museum of Southern Art, the National WWII Museum, and the Louisiana Children’s Museum. Come here to see interactive modern art exhibits, learn about NOLA’s role in WWII technology, or let kids play and learn at the children’s museum. Mid-City area and Treme neighborhood are best known for three New Orleans attractions: historical architecture, City Park, and the annual Jazz Fest. Jazz Fest, a celebration of music that attracts thousands of visitors each year, is held at the New Orleans Fairgrounds. Other attractions in this area are the Botanical Garden and the New Orleans Museum of Art, a traditional art museum with a respectable collection of 18th and 19th century European and American paintings and sculptures. Fans of the HBO show Treme may be excited to visit the historic Creole neighborhood in real life. You’ll find Louis Armstrong Park (fun fact: Louis Armstrong was born in New Orleans in 1901), as well as great restaurants and venues with live jazz. There are several options for navigating your way from place to place as you experience all the fun things to do in New Orleans. You can drive, although you’ll find that parking can be tough along the narrow streets of the historic quarter. Plus, a lot of the streets here are one-way or pedestrian-only. There are some parking lots, but the prices can get outrageous during festivals like Mardis Gras. New Orleans also has lots of taxis, as well as Uber and Lyft. If you’re making your New Orleans visit during Mardis Gras or Jazz Fest, then you might have to deal with long waits and those annoying Uber surge prices. You could also give the New Orleans bus system a try. The buses run regularly, usually every ten minutes at central stops. It’s $1.25 for a single ride, or you could buy a one day, three day, or 31 day “Jazzy Pass” for unlimited rides. A fun way to get around to see New Orleans attractions is to hop on the historic, above-ground trolleys. These picturesque trolleys date back to 1835 and are as much of a tourist attraction as they are a convenient way to get around. The trolleys cost $1.25 to ride and 25 cents to transfer. Finally, you can take river cruise boats and ferries to make your way down or across the Mississippi River. You might take a ferry to visit the Algiers neighborhood, or join a river boat tour for an afternoon of live jazz. Speaking of jazz, let’s take a look at some of the top spots for live jazz as you plan out what to do in New Orleans, the birthplace of this uniquely American music form. Fans of jazz can find some of the world’s best live music on a nightly basis in New Orleans. You might also come across a “jazz funeral,” a procession held following a funeral during which the music gradually shifts from somber to more upbeat. Below are some of the best venues for live jazz on a regular basis, but you might also just walk down Frenchmen Street after dark and listen for music that you like! Here are some of the top spots for live music within New Orleans’ vibrant nightlife scene. The Spotted Cat: This is a popular spot on Frenchmen Street. Besides traditional jazz, they also host bands that play gypsy swing, blues, and Latin music. Whatever the genre, the music is usually upbeat and great for dancing. Another nice perk: The Spotted Cat doesn’t charge a cover. Address: 623 Frenchmen St.
Snug Harbor Jazz Bistro: Close to the Spotted Cat is this small, intimate jazz club attached to a larger restaurant. You have to pay a cover charge of $10 or more to get into the jazz club, depending on the performer. Alternatively, you could eat at the restaurant and watch the performance live on TV screens. Address: 626 Frenchmen St.
Preservation Hall: This well-known music hall hosts a lot of local talent. Because the music is so good, the lines can get long and there’s often only standing room. Address: 726 St. Peter St.
Irvin Mayfield’s Jazz Playhouse: This place belongs to Irvin Mayfield, a Grammy-winning trumpeter. It’s an upscale but comfortable playhouse that features local jazz musicians every night of the week. Address: 300 Bourbon St.
Fritzel’s: This spot is a German beer hall on Bourbon St with nightly music. It often has a big international crowd. Address: 133 Bourbon St. Candlelight Lounge: Come here to see Treme Brass Band perform every Wednesday or The Treme Tet Funk Band on Sundays. Address: 925 N Robertson St. The Davenport Lounge: This elegant, upscale lounge hosts four performances a week by the well-known jazz trumpeter and singer, Jeremy Davenport. Dress up a bit. Address: 921 Canal St. It almost feels sacrilegious to narrow down the list of excellent music venues in New Orleans, because there might actually be no limit to them. So as not to anger the jazz gods, here are a few more great options: Palm Court Jazz Cafe, The Maison, Sweet Lorraine’s, Bacchanal, Monteleone Hotel Carousel Bar, Vaughan’s Lounge, Maple Leaf, Blue Nile, and Polo Club Lounge. Where can you find the ultimate expression of New Orleans’ lively music, bright colors, and general celebration of excess? That would be in its yearly celebration of Mardis Gras in late February and early March! Beyond this famous party, New Orleans also hosts several other annual festivals celebrating music, fun, and life in general. Since some of these festivals attracts hundreds of thousands of people, you’ll need to make reservations well in advance if you plan to attend. 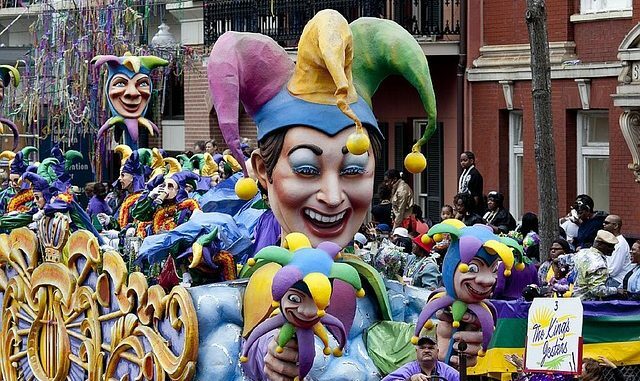 Here are some of the top festivals and things to see in New Orleans! Madris Gras: Fat Tuesday! No one celebrates the weeks leading up to Ash Wednesday like New Orleans. The streets fill with celebrations and parades for weeks. People don elaborate costumes and ride on top of extravagant floats, throwing out treats and bead necklaces to the crowds. You can actually see some of the sculptures, floats, props, and costumes year-round in an exhibit at Mardis Gras World. Many of the parades follow the same route every year. Some of the most popular ones are Endymion, Bacchus, Zulu, and Rex. Jazz Fest: This huge music heritage festival attracts hundreds of thousands of people to New Orleans on the last weekend of April and first weekend of May every year. Held at the New Orleans Fairgrounds, Jazz Fest hosts jazz, Cajun, blues, R&B, gospel, folk, Latin, rock, rap, country, and bluegrass music. You’ll also find lots of delicious Creole food and crafts for sale at this top attraction in New Orleans. San Fermin en Nueva Orleans: Running of the Bulls in New Orleans? Why not! This July festival was started by a group of friends to mimic the Pamplona tradition. One small difference – the “bulls” are women on roller skates with plastic baseball bats. Southern Decadence: This LGBTQ pride festival is held every year on Labor Day weekend. It involves big parades and dance parties that follow a new theme every year. The 2016 theme is Decadence Takes the World, and the official colors are ruby, pearl, sapphire, and amethyst. Halloween and the Voodoo Experience: New Orleans residents take Halloween seriously, wearing elaborate costumes and marching in parades on the days leading up to Halloween. The Voodoo Experience festival takes place in late October too, and it brings in lots of pop, alternative, and contemporary musicians. Nowhere is New Orleans’ multicultural heritage clearer than in its native Creole cuisine. Creole food combines elements from French, Spanish, West African, Native American, and European cooking. A lot of it incorporates the so-called Creole trinity: celery, bell peppers, and onions. You can also find some good Cajun food in New Orleans, but it’s not actually from here. Cajun food developed in other areas in Louisiana. Gumbo: gumbo is a thick, flavorful stew. It usually contains meat or shellfish, has the “trinity” of celery, bell peppers, and onions, and is sometimes served over rice. Jambalaya: This tasty rice dish has meat or seafood, spices, the trinity, tomatoes, and chili. It can be made with chicken, pork, crayfish, seafood, and/or Andouille sausage. Crawfish: aka, crayfish. They’re usually boiled in spicy water and served with corn and potatoes. Oysters: usually served raw or battered and fried. Dirty rice: rice fried with chicken liver, celery, pepper, and onion and spiced with cayenne and black pepper. Po’ Boys: sandwiches on French bread. The exact fillings differ by restaurant, but are most commonly roast beef with a gravy, oysters, and fried shrimp. If you ask for the sandwich to be “dressed,” then it will have lettuce, tomato, pickles, and mayo. Beignets: delicious square donuts with powdered sugar. Bananas foster: warm bananas with cinnamon, sugar, and butter, usually served over vanilla ice cream. Snowballs: shaved ice flavored with condensed milk or syrup. Some places just have one or two syrups, while others give you over 20 options, including various kinds of fruit, coffee, chocolate, vanilla, ginger, and more. Here are a few suggestions for where to find great Creole food and desserts. I also included one of the more gourmet snowball stands, though if you’re visiting New Orleans in the summer, the best snowballs are usually located at whichever stand is the closest! Dryade’s Public Market: This big market has lots of affordable options for brunch, lunch, or dinner. The space includes sandwich, oyster, pasta, and salad bars and other prepared foods. Address: 1307 Oretha Castle Haley Blvd. Cavan: This modern restaurant has rave reviews for its seafood and raw bar. Make a reservation or sit at the bar or upstairs cocktail lounge. Address: 3607 Magazine St.
Killer Po’ Boys: This sandwich shop in the French Quarter serves up a variety of po’ boys, including vegetarian ones. Address: 219 Dauphine St.
Copper Monkey: I can’t speak to most of the food on the menu, but I had jambalaya so good here I went back the second day to get it again. They also apparently have homemade beignets stuffed with bananas, cinnamon, and sugar. I’m hoping that this dessert is a new addition to the menu; otherwise, I’m kicking myself for missing out on it while I was there! Address: 725 Conti St.
Bennachin: This restaurant serves up New Orleans-influenced West African cuisine, including lots of vegetarian dishes. Address: 1212 Royal St.
Brigtsen’s: You can find modern Creole food in this quaint Victorian cottage. Entrees range between $20 and $30. Address: 723 Dante St.
Cafe du Monde: This is the most famous spot in New Orleans for beignets. It opened by the Mississippi River in 1862. Today, the lines can get very long. I actually felt let down by Cafe du Monde. It was a big, super touristy cafe, and I prefer cafes to have a smaller, more intimate atmosphere. The beignets and cafe au lait are really good, though. Address: 800 Decatur St.
Cafe Beignet: I prefer Cafe Beignet for tasty Southern donuts. It’s a cozy indoor cafe with amazing beignets and coffee. Address: 334 Royal St.
Hansen’s Sno-Bliz: This place has been serving the shaved ice treats since 1939! It has lots of homemade syrups in a variety of flavors, including various fruits, cream of chocolate, cream of coconut, anise, cardamom, ginger-cayenne, and honey lavender. Address: 4801 Tchoupitoulas St.
New Orleans only has one law about public drinking: keep your cocktail in a plastic cup. You can easily find these plastic cups at most bars, where bartenders let you take your drink to go if you’re not finished with it before you’re ready to move on to the next stop. Coming from regulation-happy Boston, New Orleans’ attitude toward closing times (basically a quarter to never) and public drinking felt totally foreign and free-spirited. I remember especially being struck by the upscale art galleries that had “drink tables” by the entrance for you to place your cocktail while you browsed. While you can find any kind of cocktail in New Orleans, which ones are native to the city? New Orleans is known for bourbon, sazeracs, Ramos gin fizzes, grasshoppers, and Abita beer. Sazerac is a cocktail containing rye whiskey, bitters, a sugar cube, and sometimes absinthe. The Ramos gin fizz is a bit more complicated, with a mix of gin, simple syrup, lemon juice, lime juice, egg white, heavy cream, orange blossom water, and club soda, all shaken together vigorously. New Orleans is also home to the grasshopper, a mint-flavored after dinner drink containing creme de menthe, creme de cacao, and cream. It’s usually shaken with ice, strained, and served chilled. Another popular drink, mostly among partying tourists, is the hurricane, a fruit punch and rum concoction. You can also try the local beer, Abita, or the brews of NOLA Brewery (NOLA stands for New Orleans Lager and Ale). As a city that loves to celebrate, New Orleans holds an annual festival around its drinks. Every July is the Tales of the Cocktails celebration for people to sample cocktails and bartenders and mixologists to attend seminars. So where can you find some of the best sazeracs and Ramos gin fizzes in the country? Below are some recommendations for the best bars in New Orleans. Narrowing down a list of bars in New Orleans is as hard as narrowing down its music venues. I made the attempt, though, with this list of places ranging from dive bars to fancy hotel bars. You might also find a favorite walking along Frenchmen, Lower Decatur, or Bourbon Street after dark. Read on for the best places to imbibe on your New Orleans visit. Tujague’s: Birthplace of the grasshopper. This atmospheric bar has great cocktails, and the structure of the bar itself dates back to 1856. Address: 823 Decatur St.
Jean Lafitte’s Old Absinthe House: This 200-year-old bar is famous for its absinthe drinks, plus it serves lots of other traditional New Orleans cocktails. Because of its history and location in the French Quarter, it’s a popular spot with tourists. Address: 240 Bourbon St.
Arnaud’s French 75 Bar: This upscale bar serves up classy cocktails inside its warm wooden interior. Address: 813 Bienville St.
Pat O’Brien’s: This rum bar invented the hurricane. You’ll find big, inexpensive drinks, a touristy crowd, and dueling pianos. Address: 718 St Peter St.
Carousel Bar and Lounge: Sit around a charming old merry-go-round in this upscale bar and enjoy one of the best Ramos gin fizzes in New Orleans. The seats, you might be relieved or disappointed to hear, aren’t moving. Address: Hotel Monteleone, 214 Royal St.
Sazerac Bar: As the name suggests, this fancy bar serves great sazeracs, as well as other cocktails in the Roosevelt Hotel. Address: The Roosevelt New Orleans, 130 Roosevelt Way. Napoleon House Bar and Cafe: This atmospheric, 200-year-old bar was once home to a New Orleans mayor who offered it as refuge to Napoleon. For one reason or another, Napoleon never managed to get himself to Louisiana. Don’t be surprised if you find yourself shouting, “Vive l’empereur!” over high-quality cocktails and food. Address: 500 Chartres St.
Twelve Mile Limit: This large indoor and outdoor place has inexpensive drinks and a young crowd. You can get cheap beer or carefully crafted cocktails. Address: 500 S Telemachus St.
Lafitte’s Blacksmith Shop: This bar dates back to the early 1700s, when it was used as a base for smuggling operations. In addition to the well-priced drinks, you might spot the apparitions of long-dead pirates floating in the eaves. Address: 941 Bourbon St. While it’s easy to lose yourself in the non-stop parties and concerts of New Orleans, you should also check out its thriving traditional and contemporary art scene. Below are some of the best art and history museums in the city. New Orleans Museum of Art: This huge museum has 46 galleries housing 16th to 20th century European paintings and sculptures and 18th to 19th century American paintings and sculptures. It also has collections of Asian, African, and Native American art, photography, and decorative arts and treasures. Contemporary Arts Center: New Orleans’ modern art museum was established in a 30,000-foot warehouse. In addition to the exhibits of bold contemporary art, the center hosts performing arts, events, and educational programs. Ogden Museum of Southern Art: This museum has the largest collection of American Southern art in the world. It also holds a music series on Thursdays in the atrium. National WWII Museum: This history museum, affiliated with the Smithsonian, focuses on the US role in the war. It also features the New Orleans-based Higgins Industries, which developed Higgins boats, amphibious crafts that played an important role during the war. 1850 House: This house is furnished in its original 1850 style. You can see domestic goods and decorate arts of the 1850s, which was a prosperous time in New Orleans. Now that we’ve taken a look at museums in New Orleans, let’s get back to the party! Along with all the festivals and live music, NOLA also has a big nightlife and dancing scene. You’ll find everything from big nightclubs to casual dancing on outdoor patios. Here are a few suggestions for where to dance the night away in New Orleans. Beach on Bourbon: You can find this big club on Bourbon St. It has an outdoor and indoor area, nightly DJs, a big dance floor, and last but certainly not least, a mechanical whale. Address: 227 Bourbon St.
Cafe Negril: Come to this Frenchmen Street club for funky live music and a busy dance floor. Address: 606 Frenchmen St.
Mojitos: This bar has live music and salsa dancing every Sunday night on its outdoor patio. Address: 37 Esplanade Ave.
One Eyed Jack’s: If you were hoping for a place to break out your shoulder pads and hairspray, this is it. One Eyed Jack’s holds an 80s themed dance party every Thursday night, and a lot of people dress up in their 80s finest. Address: 615 Toulouse St.
Metropolitan Nightclub: This two-story warehouse club has 11 bar stations, a light show, smoke machines, and top DJs. Address: 310 Andrew Higgins Dr. Guided tours may sound like one of those boring activities you’re forced to do with your parents or on a school field trip, but New Orleans actually makes them lots of fun. You can see all sorts of strange corners of the city on these themed tours, whether you’re hunting for ghosts on a voodoo tour or driving out to the massive, oak-shaded plantations that sit just outside the city. Here are some of the top tours that you can enjoy on your vacation to New Orleans. Ghost tour: New Orleans ghost tours bring you around the old cemeteries and haunted houses of the city, filling your ear with eerie legends about the dark and mysterious events in the city’s past. The original group to give these nighttime walks is Haunted History Tour. The two-hour jaunt is $25 for adults ($18 reduced). Horse and carriage tour: If you’d rather opt for romantic over macabre, then hop in one of the horse-drawn carriages waiting around Jackson Square. The driver will tell you anecdotes and history as you travel around the French Quarter the way people did a hundred years ago. The carriages cost about $12 for half an hour. Culinary tour: These walking tours stop at restaurants and bars throughout the city for yummy samples. Check out Bon Moment Culinary Tours (about $45) or Doctor Gumbo Tours (about $55). Plantation tour: Visit extravagant homes from the antebellum south and the surrounding slaves quarters. Some good tours are Gray Line New Orleans, Cajun Pride Plantation Tours, and Plantation Tours by Isabelle. They cost about $80 for a full day tour with transportation. If you have a car, you could also visit the plantations yourself. Some of the best ones to see are Laura, Whitney, Oak Alley, San Fransisco, and Destrehan. A hundred years ago, the main way to get to New Orleans was by boat along the Mississippi. Today, you can travel on a 19th century riverboat down the wide river while enjoying Creole food and live jazz. The most popular boats to show you all the things to see in New Orleans along its shore are the Steamboat Natchez and the Creole Queen. You can go in the daytime or later on for dinner and a night-time cruise. The cost is about $30 to $40 a person. Elephants, komodo dragons, and tigers, oh my! Another fun thing to do in New Orleans is to visit the 58-acre Audubon Zoo, home to over 2,000 animals. You can visit gorillas, orangutans, anacondas, giraffes, flamingos, jaguars, and rare white tigers, to name a few animals who call the zoo home, and make your way over to see fish and insects at the aquarium and insectarium. One of the zoo’s most unique exhibits is the Swamp Exhibit, an area designed to look like a Louisiana swamp. The area contains a floating Cajun houseboat, as well as taxidermied animals native to Louisiana, including black bears, raccoons, otters, and alligators. Zoo tickets are $19.95 for adults and $14.95 for children. It’s open everyday from 10 AM to 5 PM. The Louisiana swamps evoke a sense of timelessness. You float through the still waters beneath curtains of Spanish moss hanging from gnarled cyprus trees. You’ll see sunbathing turtles, sneaky raccoons, delicate white herons, and the watchful eyes of alligators lurking beneath the surface. Along the shore squat old, single-room cabins where people used to live in the swamp. The closest swamp to New Orleans is now protected as part of the Jean Lafitte Nature Preserve. I went on a New Orleans swamp tour and loved the beautiful surroundings and unique chance for nature photography. Prices range depending on whether or not you need transportation. A boat ride is just about $20 without transportation from and to the city, but it goes up to $50 or so with a ride. You can also go on two or three hour kayaking and canoeing tours, which cost somewhere between $50 and $60. The top rated New Orleans swamp tours outside New Orleans are Cajun Encounters Tour Company, Ultimate Swamp Adventures, and Honey Swamp Tours. Some of the best kayaking groups are Wild Louisiana Tours and New Orleans Kayak Swamp Tours. While New Orleans is a highly popular tourist destination and bursting with festivals and celebrations, it’s also still dealing with the aftershock of Hurricane Katrina. Many areas, particularly those of lower-income that aren’t prime tourist spots, are still struggling to rebuild 11 years later. Over 80% of New Orleans flooded when the levees broke during Hurricane Katrina, one of the deadliest and most destructive hurricanes to ever hit the U.S. Over 1,400 people died, many of them still unaccounted for, and thousands lost their homes during the flooding. The 7th, 8th, and 9th ward of New Orleans suffered the most damage, with the lower 9th ward being the worst hit. There are New Orleans tourism groups that take visitors on “disaster tours,” showing them the restored and still struggling areas. These tours are controversial, with some people considering them to be voyeuristic and exploitative. In 2006, the tours were so intrusive that the New Orleans City Council banned them in the lower 9th ward. These areas are still in need of resources and rebuilding, and there are opportunities to volunteer for those interested. Two volunteer groups are New Orleans Habitat for Humanity and Rebuilding Together New Orleans. Sorting through my impressions from my trip to New Orleans, a few images rise to the surface. I think about listening to live jazz in a dark, hundred-year-old bar. I remember jambalaya beside a cold gin cocktail with fresh mint. There were purple flowers tumbling off of Spanish balconies, old riverboats on the Mississippi, and silent, spooky swamplands full of alligators. As one of the oldest cities in the U.S., New Orleans bursts with historic charm and a lively atmosphere. Over the last few hundred years, New Orleans became home to people from all over the world. From its blend of global cultures grew distinct new forms of music and food. Each and every night, you’ll find great live music of all genres, from traditional or contemporary jazz to blues to rockabilly.